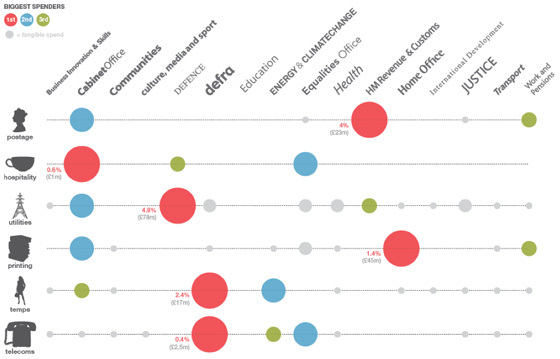 Government spending: Who’s doing what with the new data? Today sees the biggest release of government spending data in history. Government departments have published details of all spending over £25,000 for the past six months and, according to this morning’s announcement, will continue to publish this expenditure data on a monthly basis. According to minister for the Cabinet Office and paymaster general Francis Maude, it is part of a drive “to make the UK the most transparent and accountable government in the world”. We’ve already released a revolutionary amount of data over the last six months, from the salaries of the highest earning civil servants to organisation structure charts which give people a real insight into the workings of government and is already being used in new and innovative ways. A huge amount of public spending data has indeed been published under the current government, and today’s release is a significant addition to that. So who is doing what with the vast amount of new data? And who is making it easier for others to crunch the numbers? Leading designer and data expert David McCandless has also lent a hand, analysing expenditure department by department. The Guardian are liveblogging the release too, of course. The Telegraph is leading with coalition spend on PR and marketing, but gets pretty quickly stuck into yoga and pet food, the real nitty gritty. The Financial Times (registration required) has done some analysis of the effect of cuts on the private sector, but also made sure to dig some dirt: £750 an all-day meeting in a bar for Equalities and Human Rights Commission staff and £164,000 on water coolers for staff at HMRC. There are 90,000 HMRC staff. They spent £164,000 in six months on bottled spring water. That equates to an annual spend per head of only £3.64. So the FT are seriously suggesting that £3.64 per head to give staff fresh bottled water is excessive? Pathetic journalism. “The biggest issue with all these numbers is, how do you use them? If people don’t have the tools to interrogate the spreadsheets, they may as well be written in Latin.” – Simon Rogers, Guardian Data Blog editor. “Releasing data is all well and good, but to encourage the nation’s ‘armchair auditors’, it must be readily usable.” – Martin Stabe, FT. Here are some of the places you can go, along with the Guardian, to have a crack at the numbers yourself. Please add your own suggestions in the comments below. [T]he real power of this data will become clear in the months to come, as developers and researchers – you? – start to link it to other information, like the magisterial OpenlyLocal and the exciting WhosLobbying. Please make use of our API and loading scripts to do so. Also see the good suggestions on Where Does My Money Go? for how government data publishing might be improved in the future. So, coming full circle I return to the Guardian, and to the data-minded Simon Rogers, who asks: Will the government spending data really change the world? A big question. Feel free to add your opinion below and any other data projects you have seen today or that pop up in the future. 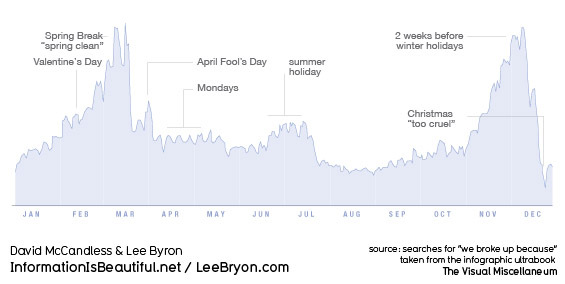 This entry was posted in Data, Handy tools and technology, Online Journalism, Politics and tagged #datajournalism, coalition, Coins, data, Data journalism, government spending, government spending data, The Guardian, timetric, tony hirst on November 19, 2010 by Joel Gunter. #iweu: The web data revolution – a new future for journalism? 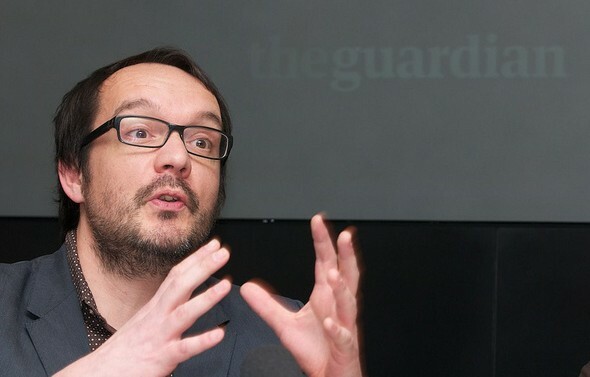 Rounding off Internet Week Europe on Friday afternoon, the Guardian put on a panel discussion in its Scott Room on journalism and data: ‘The web data revolution – a new future for journalism’. Taking part were Simon Rogers, David McCandless, Heather Brooke, Simon Jeffery and Richard Pope, with Dr Aleks Krotoski moderating. They often circulate widely online. Large, unwieldy datasets share none of those traits, they are extremely difficult and slow to process and pretty unlikely to go viral. So, as McCandless’ various graphics showed – from a light-hearted graph charting when couples are most likely to break up to a powerful demonstration of the extent to which the US military budget dwarfs health and aid spending – visualisations are an excellent way to make information accessible and understandable. Not a new way, as the Guardian’s data blog editor Simon Rogers demonstrated with a graphically-assisted report by Florence Nightingale, but one that is proving more and more popular as a means to tell a story. But, as one audience member pointed out, large datasets are vulnerable to very selective interpretation. As McCandless’ own analysis showed, there are several different ways to measure and compare the world’s armies, with dramatically different results. So, Aleks Krotoski asked the panel, how can we guard against confusion, or our own prejudices interfering, or, worse, wilful misrepresentation of the facts? McCandless’ solution is three-pronged: firstly, he publishes drafts and works-in-progress; secondly, he keeps himself accountable by test-driving his latest visualisations on a 25-strong group he created from his strongest online critics; third, and most important, he publishes all the raw data behind his work using Google docs. Access to raw data was the driving force behind Heather Brooke’s first foray into FOI requests and data, she told the Scott Room audience. Distressed at the time it took her local police force to respond to 999 calls, she began examining the stats in order to build up a better picture of response times. She said the discrepancy between the facts and the police claims emphasised the importance of access to government data. Prior to the Afghanistan and Iraq war logs release that catapulted WikiLeaks into the headlines – and undoubtedly saw the Guardian data team come on in leaps and bounds – founder Julian Assange called for the publishing of all raw data alongside stories to be standard journalistic practice. As Simon Rogers pointed out, the journalistic process can no longer afford to be about simply “chucking it out there” to “a grateful public”. There will inevitably be people out there able to bring greater expertise to bear on a particular dataset than you. But, opening up access to vast swathes of data is one thing, and knowing how to interpret that data is another. In all likelihood, simple, accessible interfaces for organising and analysing data will become more and more commonplace. For the release of the 400,000-document Iraq war logs, OWNI.fr worked with the Bureau of Investigative Journalism to create a program to help people analyse the extraordinary amount of data available. Simply knowing where to look and what to trust is perhaps the first problem for amateurs. Looking forward, Brooke suggested aggregating some data about data. For example, a resource that could tell people where to look for certain information, what data is relevant and up to date, how to interpret the numbers properly. 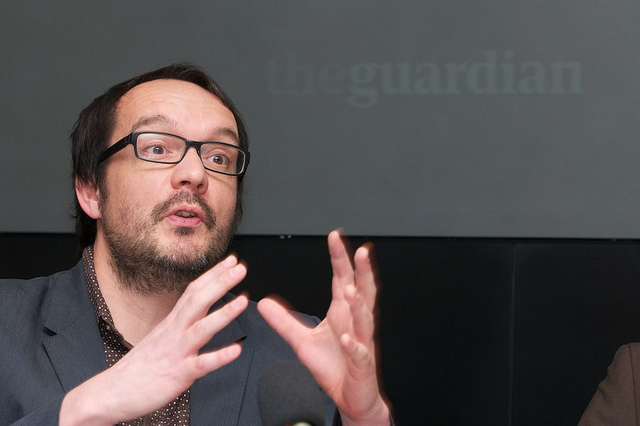 So does data – ‘the new oil’ – signal a “revolution” or a “new future” for journalism? I am inclined to agree with Brooke’s remark that data will become simply another tool in the journalists armoury, rather than reshape things entirely. As she said, nobody is talking about ‘telephone-assisted reporting’, completely new once upon a time, it’s just called reporting. Soon enough, the ‘computer-assisted reporting’ course she teaches now at City University will just be ‘reporting’ too. Digital journalist Sarah Booker liveblogged presentations by Heather Brooke, David McCandless and Simon Rogers. This entry was posted in Data, Events, Investigative journalism and tagged #datajourn, #datajournalism, data, Data journalism, data visualisation, david mccandless, heather brooke, information is beautiful, richard pope, scraperwiki, simon jeffery, Simon Rogers, The Guardian on November 15, 2010 by Joel Gunter. Hirst has a number of queries in regards to data quality and ‘misleading’ linking on the Guardian DataBlog. In a later comment, he wonders whether there is a ‘data style guide’ available yet. If you’re not all that au fait with the data lingo, this post might be a bit indigestible, so we’ll follow with a translation in coming days. Related on Journalism.co.uk: Q&A with Hirst, April 8, 2009. This entry was posted in Editors' pick, Online Journalism and tagged #datajourn, #datajournalism, guardian, Journalism.co.uk, open platform, The Guardian, tony hirst on June 8, 2009 by Judith Townend.